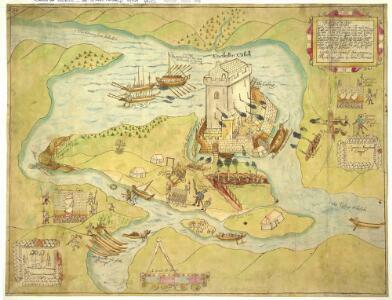 A Coloured Representation, or Bird's-Eye View, of the Storm of "Eneskillin Castell"
Description: This is a pictorial battle plan dating from 1594 of the 1592 siege of Eniskellen castle in Ireland. Although it is attributed Made and dun by John Thomas Solder’ nothing more is known about the draughtsman except that he drew a similar plan of the battle at Beleek the previous year. The activities of war are shown in great detail. It shows how the castle was taken using cannons in trenches, a greate bote’ with 67 men on board which was rowed round and anchored by the wall to breach it, and scaling ladders on the far side of the castle. In Governor Dowdalls Campe’ in the lower left of the drawing is The howse of munition’ and the heads of three rebels are displayed on posts.